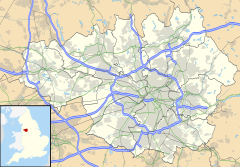 Hyde is a town in Tameside, Greater Manchester, England, which in 2011 had a population of 34,003. Historically in Cheshire, it is 5 miles (8 km) northeast of Stockport, 6 miles (10 km) west of Glossop and 7 miles (11 km) east of Manchester. Newton Hall was present in the 13th century. The area formed a township of the parish of St Mary, Stockport. Its name is derived from the Hide, a measure of land for taxation purposes, taken to be that area of land necessary to support a peasant family. In later times it was taken to be equivalent to 120 acres (49 ha). In the late 18th century the area that was to become the town centre was no more than a cluster houses known as Red Pump Street. Gee Cross was much larger and 'Hyde' was still only used to refer to the estates of Hyde Hall on the banks of the River Tame. Altogether there were only 3,500 inhabitants in the district in 1801. The town is largely a creation of the 19th century and the Industrial Revolution. The population of Hyde increased due to the success of the cotton mills during the Industrial Revolution of the late 18th and early 19th centuries, at one stage there were 40 working mills. By 1872 only 27 remained, half of the remaining mills closed between 1921 and 1939 and there is only one working mill in the town today. There were many mill owning families, including the Sidebotham, Hibbert and Horsfield families. The main employers in the mills were the Ashton family who successfully ran a combined spinning and weaving company. Most mills concentrated on one process only. The Ashton family built Hyde Chapel on Stockport Road, Gee Cross. The Ashton Brothers' Mill has recently been demolished to make way for a housing estate. St George's Church was built in 1832 as a chapel of ease to St Mary's, Stockport. It was built at the instigation of John Hyde Clarke of Hyde Hall and was the first Church of England place of worship in the town. St George's became the parish church of part of Hyde township in 1842. Later additions include the lychgate, boathouse by the canal, hearse house, parish rooms and numerous vicarages. The church has a 110-foot (34 m) tower housing eight bells and a clock. The Peak Forest Canal was constructed through Hyde from Ashton-under-Lyne to Woodley, Romiley and Marple. Captain Clarke's Bridge, originally named Wood End Canal Bridge is situated at the end of Woodend Lane. The bridge was erected before Captain Clarke rose to prominence and therefore probably became known as Captain Clarke's Bridge after he retired and resided there. There was also a coal mine, known as Hyde Colliery, in the town and in January 1889 an explosion there killed 23 miners. There was an enquiry held the following month at the town hall. See http://www.cotswan.com/edward_jackson.htm for an account of part of the enquiry. The following month Ardwick AFC, modern day Manchester City, played Newton Heath, modern day Manchester United, under floodlights at Belle Vue to raise money for the victims' families. The game was watched by 10,000 people and this was the first floodlit match played by either side. During the 1960s, Myra Hindley and Ian Brady were arrested in their home on the Hattersley estate in Hyde after police found the body of 17-year-old Edward Evans in the house. At their trial they were found guilty of murdering Evans as well as two other children whose bodies were found buried on Saddleworth Moor several miles away. Britain's most prolific serial killer, Dr Harold Shipman, had his doctor's surgery in the town where he murdered most of his several hundred victims. The first known victim was 86-year-old Sarah Hannah Marsland of Ashton House in Victoria Street on 7 August 1978 and the last was Kathleen Grundy of Joel Lane on 24 June 1998. On 18 September 2012, drug dealer Dale Cregan made a hoax emergency call to the police from an address in Hattersley, luring Police Constables Nicola Hughes, 23, and Fiona Bone, 32, of Greater Manchester Police there by claiming that there had been an incident of criminal damage. When they arrived, he murdered them. Hyde was incorporated as a municipal borough of Cheshire in 1881, which covered the parishes of Hyde, Godley and Newton, along with part of Compstall. In 1936 the borough was extended by the annexation of the civil parish of Hattersley and part of the civil parish of Matley from Tintwistle Rural District. The whole of the municipal borough became part of the Metropolitan Borough of Tameside, Greater Manchester in 1974 under the Local Government Act 1972. Hyde Town Hall dominates the market place area. The large bell in the clocktower is known as Owd Joss (Old Josh), named after Joshua Bradley, a former poor child worker in the mills. The clock chimes the Westminster Quarters. As a county palatine Cheshire was unrepresented in Parliament until the Chester and Cheshire (Constituencies) Act 1542. From 1545 Cheshire was represented by two Knights of the Shire. On the passage of the Great Reform Act of 1832, the area of Hyde was included in the North Cheshire constituency. Between the passing of the Second Reform Act of 1867 and the Redistribution of Seats Act 1885, the town was part of the East Cheshire constituency. Between 1885 and 1918 the town was part of the Hyde county constituency. Since the 1918 general election, the town has been represented in Parliament by the member for the Stalybridge and Hyde county constituency. The current Member of Parliament is Jonathan Reynolds. Werneth Low Country Park is the location of the Hyde War Memorial. The memorial is owned by a trust which raised funds from Hyde residents after the Great War to create a permanent memorial to those Hyde residents who died in that conflict. The memorial contains 710 names. Hyde is separated from Denton by the River Tame, a tributary of the River Mersey. There are several areas and suburbs in Hyde, these include, Gee Cross, Newton, Hattersley, Godley, Flowery Field, Kingston, Mottram in Longdendale, Hollingworth and Broadbottom. Hyde is served by six railway stations, Hyde Central and Hyde North stations are on the Manchester Piccadilly - Romiley - Rose Hill 'Hyde Loop' line. Flowery Field, Newton for Hyde, Godley and Hattersley stations are on the electrified Piccadilly - Glossop - Hadfield line. Hyde is served by the M67 motorway, a feeder to the M60, the orbital motorway for Manchester, which is connected to many other motorways that serve across the country. Hyde also has Hyde bus station, with services into Manchester and other surrounding areas, including Stockport, Ashton-under-Lyne and Oldham. The station was originally built with an open 'bus shelter design' like many bus stations, but was rebuilt as a much larger central terminus style building, enclosed from the outside. It opened on 23 August 2007 and cost £3.7M to build. The initiative was intended to encourage people to use public transport. Ewen Fields the home of Hyde United F.C. The Hyde Seals water polo team had considerable success. From 1904 to 1914 they were regarded as the finest in the world, winning the world championship in 1904, 1905 and 1906. Dr Ron Hill, a former European gold-medallist marathon runner is from Hyde. Hyde Cricket and Squash Club play in the Cheshire County League and have their ground near Werneth Low. Flowery Field Cricket Club are part of the Lancashire County League. Professional cricketer Len Hopwood was born in Newton. World champion boxer Ricky Hatton was brought up on the Hattersley Estate and now lives in Gee Cross. His association with the town led to the creation of a boxing gym and health club by Hatton Promotions. St Paul's R.C. School & Nursery, a Catholic Primary school, First opened in the early 1900s, it was rebuilt in the early 1970s & a plaque from the original building has been preserved. Bradley Green Community Primary School, which Lee Martin and Alan Wright attended, was built in 1968. St George's C.E Primary School, the original building was built in 1836. Pinfold Primary School, was built in 1965. Godley Community Primary School, was built in 1978. Greenfield Primary School, was built in 1998. St Marys' Catholic Primary School, was built in 2010 due to a poor design of the old building in 1970. Tameside College has a base in Ashton-under-Lyne where school leavers can pursue vocational courses such as engineering, catering and travel & tourism. The qualifications offered are BTEC introductory, first and national qualifications, NVQs, Technical awards and certificates. However the college also offers a wide range of A Level courses for school leavers at Hyde Clarendon Sixth Form College and operates a Local Learning Centre for adult learners in Hyde town centre, offering courses the same as school leavers also including, higher education courses, European languages, health & safety, management & professional, sign language and teacher education & teaching assistant. Other colleges near to Hyde are, All Saints Catholic College and Ashton Sixth Form College. Hyde has a recently refurbished leisure centre which contains a large swimming pool with a wave machine, the new 'Red Ripster' aqua slide and an upstairs fitness suite. The pool also has a new changing village and a new cafe and air conditioned eating area. The octagon shaped structure which has been open since the '90s, is situated next to the neighbouring Hyde United F.C. ground. The Waldorf Playing Fields are three fields adjacent to Matley Lane in Hyde. Hyde has a small live Theatre. Situated on Corporation Street, the Festival Theatre is home to several local amateur groups presenting plays, music and dance in either the downstairs auditorium or the upstairs smaller studio. There are occasional visiting professional shows. The theatre has its own website. Hyde Park was originally part of the Newton Lodge estate which was purchased by James Ashton circa 1620. The Ashton family became cotton mill owners and were one of the two biggest employers in Hyde. The park was given to the Borough of Hyde by Eveline Mary Ashton and Amy Elizabeth Ashton in 1902. It was opened as a public park on 21 May 1904. The bandstand was opened in 1922 and in 1938 Newton Lodge was demolished and replaced by Bayley Hall. The park features a garden of tranquillity, a children's play area and a rockery. Ron Hill MBE (born 25 September 1938 in Accrington, however he currently lives in Hyde) 78 year old running legend who also worked in sports clothing. Timmy Mallett, television presenter and entertainer, born in MarpleHe was educated at Hyde Grammar school. His father was a vicar at St Georges Church. In fiction, Hyde is referenced in the BBC drama Life on Mars. In the programme, the character Sam Tyler was said to have transferred from C Division Hyde, to the City Centre, A Division CID. The choice of Hyde is given as a clue that his 1973 self is an alter ego, as in Robert Louis Stevenson's Strange Case of Dr Jekyll and Mr Hyde. The dance scene from the film Yanks (1979), which starred Richard Gere, was filmed in Hyde Town Hall. ^ "Greater Manchester Gazetteer". Greater Manchester County Record Office. Places names - G to H. Archived from the original on 18 July 2011. Retrieved 13 October 2008. ^ UK Census (2011). "Local Area Report – Hyde (Tameside) Built-up area (1119883751)". Nomis. Office for National Statistics. Retrieved 8 February 2018. ^ "Hyde". Cheshire Towns & Parishes. ukbmd.org.uk. Retrieved 27 May 2015. ^ a b "Meaning of the early use of the word "Hide"". sizes.com. Retrieved 25 August 2007. ^ James & Mellor (1989), p. 8. ^ The Times 8, 9 and 16 February 1889. ^ Cawley & James (1991), p. 320. ^ "Move Shipman's surgery". BBC News. 24 February 2000. ^ "Dale Cregan: father of murdered WPc says he should hang". Telegraph.co.uk. Retrieved 12 December 2017. ^ Great Britain Historical GIS Project (2004). "Hyde MB through time. Census tables with data for the Local Government District". A vision of Britain through time. University of Portsmouth. Archived from the original on 1 October 2007. ^ "State-of-the-Art Bus Station Opens its Doors to Hyde". Tameside.gov.uk. 23 August 2007. Archived from the original on 16 October 2008. Retrieved on 22 August 2008. ^ "Stadium Time Line". Retrieved 18 November 2013. ^ "Hyde FC to return to Hyde United". hydefc.co.uk. Retrieved 27 May 2015. ^ "Ron runs race of his life for wife". Tameside Advertiser. 30 March 2005. Retrieved on 22 August 2008. ^ Lewis, Ron (22 November 2008). "Ricky Hatton ready for career relaunch". The Times. London. ^ "High Schools in Tameside". The Tameside Citizen. Tameside Metropolitan Borough Council. Retrieved 4 September 2014. Cawley, Steve; James, Gary (1991). The Pride Of Manchester. Leicester: ACL & Polar. ISBN 0-9514862-1-7. Dykes, Garth (1994). The United Alphabet. Leicester: ACL & Polar. ISBN 0-9514862-6-8. James, Gary; Mellor, Keith (1989). From Maine Men To Banana Citizens. Nottingham: Temple Press. ISBN 1-870010-08-6. James, Gary (1993). Football With A Smile: The Authorised Biography of Joe Mercer, OBE. Leicester: ACL & Polar. ISBN 0-9514862-9-2. James, Gary (2008). Manchester A Football History. Halifax: James Ward. ISBN 978-0-9558127-0-5. Wikimedia Commons has media related to Hyde. Wikivoyage has a travel guide for Hyde.